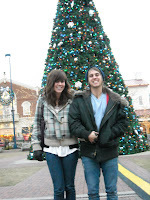 Our son and his girlfriend Alyssa accompanied us this evening as we headed to one of my favorite places, Easton. 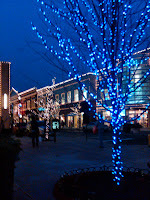 I love to walk outside at Easton Town Center when Christmas decorations are all up. It seems magical. As I stood outside waiting for my family to come out of the stores it felt like I was t he only still thing. Everyone rushed by. People bumped and hurried and sometimes spoke to one another...but mostly they hurried. I stood still and watched. Tonight I took a Christmas walk...it was amazing!